The Republic of India is the seventh largest country by area, the second most populous country with over 1.2 billion people, and the most populous democracy in the world. India shares land borders with Pakistan to the west; China, Nepal, and Bhutan to the north-east; and Burma and Bangladesh to the east. Whilst in the Indian Ocean, India is in the vicinity of Sri Lanka and the Maldives; plus India's Andaman and Nicobar Islands share a maritime border with Thailand and Indonesia. Home to the ancient Indus Valley Civilisation, historic trade routes, past empires and four of the world's religions; Hinduism, Buddhism, Jainism, and Sikhism - India is truly incredible. In my books, articles and blogs I try to share my experiences of India, its people and the wildlife. In this section I give short synopses by geographic locations. Southern India is a peninsular bounded by the Arabian Sea in the west, the Indian Ocean in the south and the Bay of Bengal in the east while encompassing two mountain ranges, the Western and Eastern Ghats, with a plateau heartland. The Godavari, Krishna, Tungabhadra, Kaveri, and Vaigai rivers are important sources of water and life. While Bangalore, Chennai and Hyderabad are the largest and most industrialized cities in the Southern India. The dominant geographical features of North India are the Indo-Gangetic Plain and the Himalayas, which demarcate the region from Tibet and Central Asia. North India has been the historical center of the Maurya, Gupta, Mughal, Sur, Maratha, Sikh and British Indian Empires. It has a diverse culture, and includes the Hindu pilgrimage centers of Char Dham, Haridwar, Mathura, Allahabad and Varanasi, the Buddhist Mahabodhi Temple, the Sikh Golden Temple and the Muslim pilgrimage destination of Ajmer, as well as UNESCO World Heritage Sites such as the Valley of flowers, Khajuraho, Bhimbetka Caves, Qutb Minar and the Taj Mahal. Western India is roughly bounded by the Thar Desert in the northwest, the Vindhya mountain range in the north and the Arabian Sea in the west. A major portion of Western India shares the Deccan Plateau with South India. The states of Maharashtra, Goa and Gujarat are varied and distinct with 450 years of Portuguese rule having a profound influence on Goa. 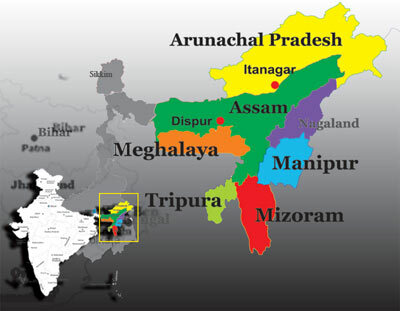 East India was at the heart of the ancient Sena, Magadha, Mithila, Maurya and Kalinga empires. In addition it was from where the British started their conquest of India.